The resources here will help you do your homework. 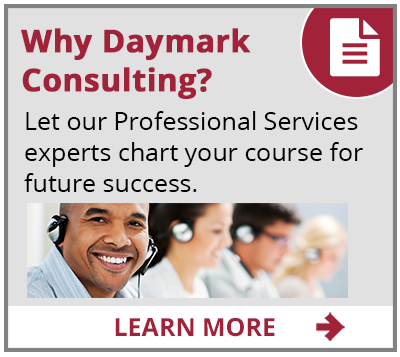 You'll find white papers, infographics, sample assessments and most importantly, customer success briefs where you can learn how Daymark clients have benefited by partnering with us. In the process of releasing two new drugs with an aging infrastructure that could not support accelerated business growth, Agios contacted Daymark to architect and implement a modern, enterprise-class data center infrastructure designed for scalability, agility and support for a hybrid cloud environment. Unreliable service from a hosted email provider prompted UniBank to look for a better way to provide email services to its users and execute on a cloud-first strategy. Daymark migrated UniBank’s Exchange environment to Microsoft Office 365 and utilized Mimecast email filtering to ensure the highest levels of data protection, security, and compliance with stringent banking regulations. Wanting to ensure optimized performance of Active Directory (AD) and DNS, SharkNinja, the maker of class-leading Shark® vacuums and the innovative line of Ninja® kitchen appliances, turned to Daymark for an expert and independent assessment of its environment to recommend best practices and identify potential security or configuration gaps. Daymark architected and rapidly deployed a new web application in the Azure cloud for Alegeus healthcare consumers, meeting the client’s stringent security, availability and performance requirements in a cost-effective manner. Denham Capital had an aggressive project timeline to decommission their outdated Texas data center. Daymark designed and deployed a comprehensive migration to Microsoft Azure, enabling Denham to benefit from the agility, scalability, performance and economies of the cloud, saving a substantial amount in the first year alone. Daymark architected a new storage infrastructure that met performance and capacity needs, drove down costs, improved DR readiness, and reduced data center footprint and power consumption, saving over $1M in the first year alone. Successfully architected, staged and supported the migration of a multi-million dollar DR infrastructure from Massachusetts to a newly constructed data center in North Carolina to provide true business continuity and disaster recovery for business operation. Daymark's professional services team redesigned CRL's virtualization and tiered storage architecture to provide a solid, secure and stable platform for their private cloud. Daymark architected the design, configuration, deployment, and migration of over 15 backup appliances. Within 90 days the entire backup environment was back in compliance with zero impact on operations. Within 60 days, Daymark safely migrated all records to a new highly-available system ensuring timely, secure and reliable access of critical patient data. System redesign and implementation successfully completed in 15 days. Doubled Reliant's backup capability while significantly reducing their average cost per TB. Daymark successfully diagnosed and remediated the complex issues impacting the online wholesaler by architecting and implementing a long-term fix during the busiest holiday season. Considering a migration to Microsoft Azure? Going it alone can create unnecessary risks, costs and delays. Daymark’s Azure Everywhere Workshop is a two-day onsite workshop at your location that leverages our expertise and proven best practices for Azure migrations to ensure your deployment is successful. Still struggling with GDPR? 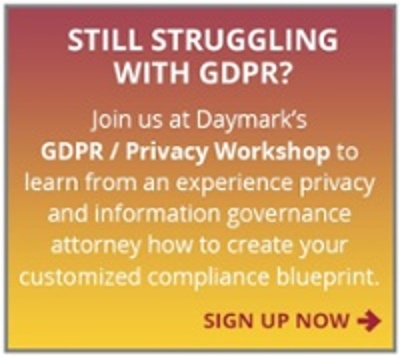 The Daymark GDPR / Privacy Workshop is a full-day onsite workshop at your location. Privacy and information governance attorney Steven J. O’Neill will conduct a completely confidential top-level assessment of GDPR and privacy risks and create a customized blueprint to jumpstart compliance efforts. Whether you’re adopting clouds like Microsoft Azure as a permanent location for business applications or as a temporary home for applications in case of a disaster recovery scenario, there are multiple factors you should take into consideration before making the move. Cloud computing has made a significant impact on IT. How and where organizations consume, build, and run critical business applications have changed dramatically. As more organizations turn to cloud computing, ESG sought to understand what kind of an impact this transition has had on the network, with specific regard to short-term spending and long-term strategy decisions. Learn successful strategies from the early adopters. The cybersecurity industry is populated with a plethora of vendors offering discrete solutions representing a fragmented market, historically absent of dominant leaders. However, acquisitions coupled with anecdotal customer feedback about point tool fatigue, indicate the cybersecurity market is at a tipping point, see who ESG believes are the three vendors emerging as enterprise-class ready. In this white paper, the Enterprise Strategy Group (ESG), provides their analysis of vendors who do (and don’t) understand how to make the move to IT Transformation. See why they call Daymark one of the solution providers that understands and embraces the new cloud realities. This Data Genomics Index Report is a first-of-its-kind examination of the true makeup of storage environments. This deep dive examination reveals areas where you can take back your storage environment. Proactively manage your information footprint to rein in costs and reduce risks. Learn how you can start gaining visibility, taking action and assuming control over your data with better information governance. Written by Steven J. O'Neill, Esq., this 10-page whitepaper examines, "Are your data destruction and retention policies industry compliant?" With the new changes to the Federal Rules of Civil Procedure (FRCP) taking place, there is no longer any excuse for the C-level and legal counsel to avoid updating your internal information and data governance policies. Why Are IT Assessments Important To Your IT Organization? This white paper describes how the latest flash arrays can cost-effectively optimize performance for your business. It offers key purchase considerations and deployment tips based on our years of experience with hundreds of financial, life sciences, and healthcare clients. Every company has a Databerg. This Infographic highlights findings from a global report covering 22 countries and 2,550 IT decision makers, illustrating the causes, risks and solutions to this looming data crisis. Your data is constantly growing, but do you know what types of information you are storing? Poor data behavior exposes organizations to risk. Learn how you can delete no-value data, control data growth and make informed decisions regarding information lifecycle. Are you ready to move from Backup Exec to NetBackup? A side-by-side comparison to help you decide, in less than a minute, if NetBackup will make your job easier. 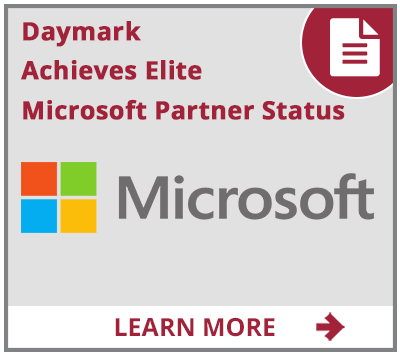 Partnering with Daymark as your Microsoft Cloud Service Provider (CSP) enables you to leverage the agility, scalability and cost benefits of the cloud, supported by Daymark and Microsoft’s extensive service capabilities. Learn how Daymark’s Azure Cloud Security delivers the security your enterprise needs to keep applications and data safe.